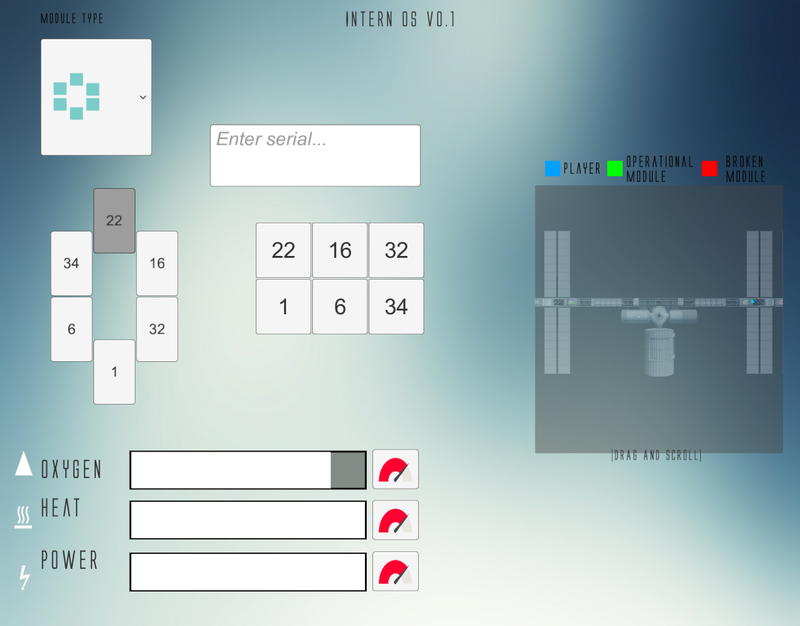 “INTERNS IN SPAAACE” is a two-player coop game where you work together to keep the space station from exploding. You will need two PCs in the same network. The Astronaut also requires an Oculus and a Leap Motion Controller. To enable the motion grid, place both hands in front of you with your palms facing away, then rotate your palms towards you. Repeat the gesture to disable it again. Once the grid is on, placing both hands in the far third of the grid will move you forward, the near third will move you back, the higher third will move you up etc. To rotate, place one hand in the near third and the other in the far third of the grid. To roll, place one hand in the lower third and the other in the higher third of the grid. To stop, place both hands in the center cell. This will quickly reduce all velocity. For visual examples of the movement controls, watch the in-game instructional video or the gameplay trailer. Once you reach a broken module, disable the motion grid then use your hands to push buttons, slide sliders or grab objects. The goal of the game is to survive until you are replaced by other interns. The astronaut can see the remaining time on his helm display. To survive, you need to keep all three station resources from dropping to zero. 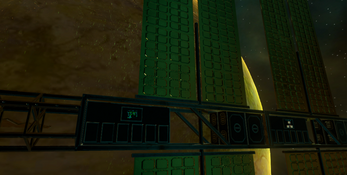 The Astronaut navigates around the space station and can repair modules based on the Operator's instructions. The Operator has an overview of where the modules are, which are broken and the state of the main station resources. He holds the solutions to all modules, and is able to overload certain resources to get a temporary boost but break a module in the process. The Astronaut tells the Operator the serial number of the module, and the values on the buttons. Once the Operator enters these values, they can see the connections the Astronaut should make by pressing on two buttons in sequence. Pressing a wrong sequence will reduce the resource. The Astronaut tells the Operator the serial number and the colors of the fuse and each fuse slot. Once the Operator sets these colors, an arrow will appear above the slot where the fuse should be put. Putting it in the wrong slot will reduce the resource. The Astronaut tells the Operator the serial number and starting positions of the sliders. Once the Operator enters them, they get back multipliers for each slider and a final needed sum. The Astronaut needs to set the sliders to certain values so that, when multiplied with the multipliers, they add up to the needed sum. If the “Send” button is pressed and the sum is wrong, the resource is reduced.